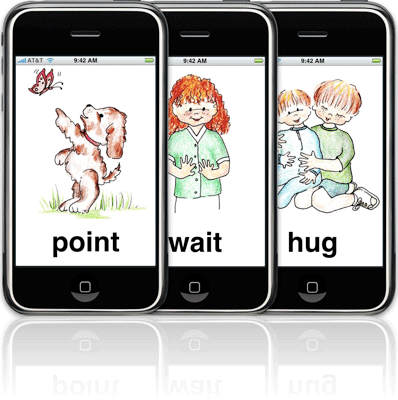 Designed and tested by a nationally certified speech pathologist with over 30 years experience working with speech and language development, this program uses prompts similar to flash cards, but the words are written, spoken and illustrated to better facilitate organized modeling and development of vocabulary and early word combinations. Runs on iPhone and iPod Touch. For children 1 to 3 years old. Designed to be used by toddlers themselves. Includes over 160 different flash cards. Swipe finger across screen to move to next or previous card. Tap once on the card to repeat the sound. Sound can be turned on/off. Alphabetical or shuffle play modes. Expandable with upcoming language decks.